I mentioned after Wednesday’s stock market close that the tech stocks and the small caps were overbought. We saw a reversal of the recent trading action on Thursday as the Dow and the S&P 500 outperformed the Nasdaq and Russell 2000. The big caps rallied after underperforming this year. McDonald’s led the Dow as it was up 4.4% after it announced a restructuring which includes corporate layoffs. The S&P 500 was nearly flat as it fell 0.07%. The Nasdaq and Russell 2000 had rough days as they were down 0.7% and 0.49% respectively. The micro cap index was down 0.71%. Heading into Thursday we were in an interesting position because I was bullish on the S&P 500 and near term bearish on tech and small caps. Many technical traders have said the strong breadth is good news for the S&P 500. That might be true, but that doesn’t mean the small caps and tech will be rallying with the S&P 500. That would put them at extremely overbought technical levels. The S&P 500 itself is slightly overbought. The CNN Fear and Greed index went from 65 Wednesday to 62 Thursday. The Brazilian stock market had a rough day on Thursday as it was down 5.13%. The Brazilian market is down 31% since the peak on January 26th which is also the day the S&P 500 peaked. There is political turmoil in Brazil which I can explain in another article. The reason I’m mentioning it here is because it was the reason there was a mini crash in treasury yields. As you can see from the chart below, investors fled Brazil and bought U.S. treasuries. The Fed doesn’t seem to care how its rate hikes can affect emerging markets, but if this type of impact is felt on U.S. markets, then the Fed will need to change its tune. The Fed affects global markets with its policies; this needs to be factor into how it sets rates. Brazil has others issues such as political corruption, so it’s not all the Fed’s fault, but it does have an impact. 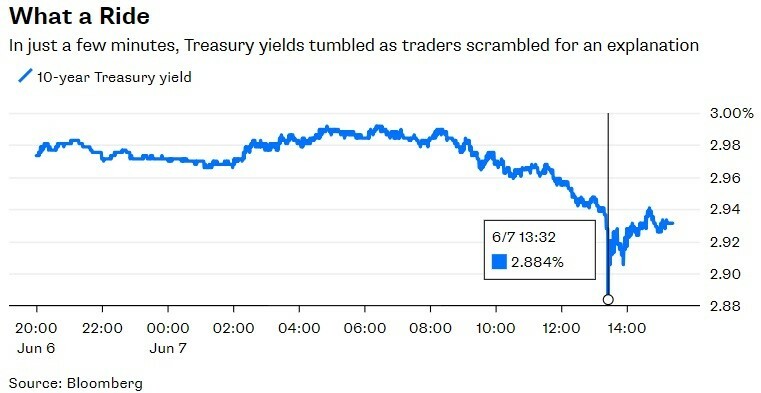 The latest difference between the 10 year yield and the 2 year yield is 44 basis points, meaning the curve flattened 1 basis point on Thursday. The Bloomberg consumer confidence index fell from 55.2 to 54.8 in the week of June 3rd. This is still a great reading, but the result has gone from spectacular to great which is bad in rate of change terms. The index peaked at 58 in April. I think if the S&P 500 rallies in the next few weeks, the consumer confidence will improve. 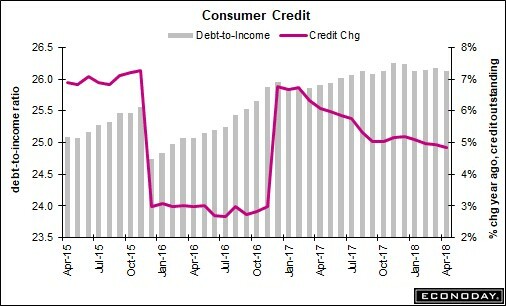 More importantly than that soft data report, the consumer credit report showed consumer credit only increased 4.8% in April. It was up 4.9% in March. You can see in the chart below the rate has been decreasing since January 2017. In nominal terms, the increase in credit was $9.3 billion which was below the lowest estimate which was $11 billion. The good news is the debt to income ratio has been decreasing in the past few months. In April, credit card debt was up slightly after being down in the past 2 months. The revolving credit was up $2.3 billion. Non-revolving credit was up only $7 billion. This includes student loan debt and vehicle financing. Since auto sales have been at a plateau, this isn’t a surprise. Auto loan debt was up 3.6% in Q1 2018. That is one of the lowest growth rates in this expansion outside of the negative growth in 2009 and 2010 as the U.S. economy was still recovering. This metric will easily fall into the negatives if the economy falters. Student loan debt growth as also been slowing rapidly. You don’t hear a lot about how quickly student loan debt growth is falling because all the people who took out loans in the past few years still need to pay off those loans. The situation isn’t getting better, it’s just getting worse at a slower pace. The debt growth had to decline as it got larger, so this isn’t as amazing as it sounds. If growth was in the double digits indefinitely, it would encompass the entire economy at some point. The year over year growth fell from 5.87% in Q4 2017 to 5.39% in Q1 2018. If the growth rate starts to fall into the negatives, the situation will finally be improving for the generation after the millennials. When the Fed started raising rates in late 2015, many economists claimed financial conditions would become more stressed. The only thing that caused stress conditions since then has been the collapse in oil prices. 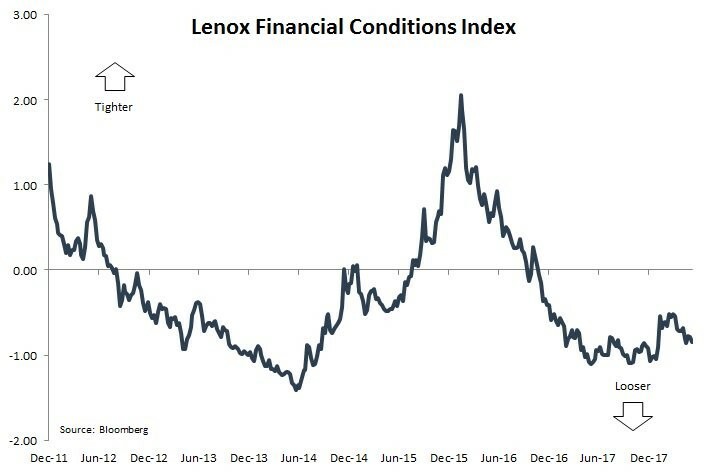 As you can see in the chart below, the financial conditions are now nearly as loose as they have been in this business cycle. The rising dollar has caused the financial conditions in emerging markets like Brazil and Turkey to become more stressed. It will be interesting to see if the Fed mentions those places in its next meeting on June 13th. If the Fed decides to stop its rate hikes because of the stress in emerging markets, it will be interesting to see if inflation picks up. That’s not a likely decision, however, because the Fed probably knew these could be consequences of rate hikes before they started raising rates. The Fed wants growth to be maintained as it raises rates to prevent inflation from becoming an issue. Next week will be one of the most important weeks of the year because we have the Fed meeting on June 13th and the summit between North Korea and Kim on June 12th. Trump was quoted as saying he would be willing to meet with Kim in the White House if this summit goes well. With such positive rhetoric, I think a deal between the two nations to stop North Korea’s nuclear expansion has already been hashed out. That’s great news for global peace.